The Game Developers Choice Awards were hosted by Double Fine founder Tim Schafer again this year. If you want to see what it's like for Tim Schafer as he prepares himself before the show, you can now live the experience in a new Double Fine online game called Host Master and the Conquest of Humor! 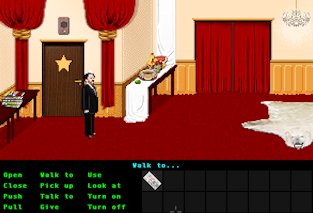 It's a point and click adventure game with the feel of the early adventure games from LucasArts! The Game Developers Choice awards show is a much better show than Spike's Video Game Awards, since it focuses on the games and the designers who made them, rather than celebrities. You can watch most of it online here.